You can try the ABCD software on an online installation of the ABCD. All features that you can access come with the default installation package of ABCD. The administrator interface is accessible at http://abcdwiki.net . By default this website opens in Portuguese. 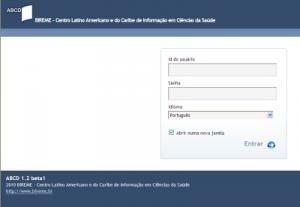 To enter this website in English, type the username after "d do usuário", the password after "Senha". Select "Ingles" in "Idioma". Deselect " Abrir numa nova janela" and click on "Entrar". A standard public website that comes with the ABCD software is at http://localhost:9090/site/. You can change the settings of the public site when you enter http://localhost:9090/site/admin.